In essence, researchers have been examining old manuscripts housed at St Catherine’s monastery in Egypt which were palimpsests – pages from which older writing had been erased and newer writing added in order to reuse the scarce parchment. 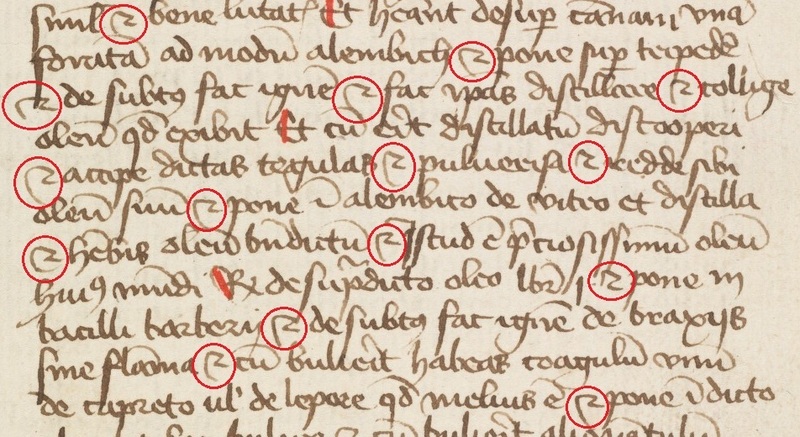 They then used various techniques to view the older text which had been partially erased and hidden. As the article says: “perhaps the most intriguing finds are the manuscripts written in obscure languages that fell out of use many centuries ago. Two of the erased texts, for instance, were inked in Caucasian Albanian, a language spoken by Christians in what is now Azerbaijan. According to Sarah Laskow of Atlas Obscura, Caucasian Albanian only exists today in a few stone inscriptions. ……. This precisely fits one of my suggestions about the Voymich – that the text was writen in a particular script which then fell into disuse and was lost to us, except in this one document. Of course this example in Egypt doesn’t prove anything at all, except that such things can happen! I was wondering if the unknown star names could be a form of yiddish/hebrew in a derivation of Georgian script? Such that cycb is the word for star in hebrew. CLC may be a derived consonant version simply of Star. The o symbol could be a replacement for Aleph. And this is what a typeface looks like when a German hand writes Latin. He was most likely to use a word-to-word translation, since he was not able to speak fluent Latin. The German text in the VM tells me the same. 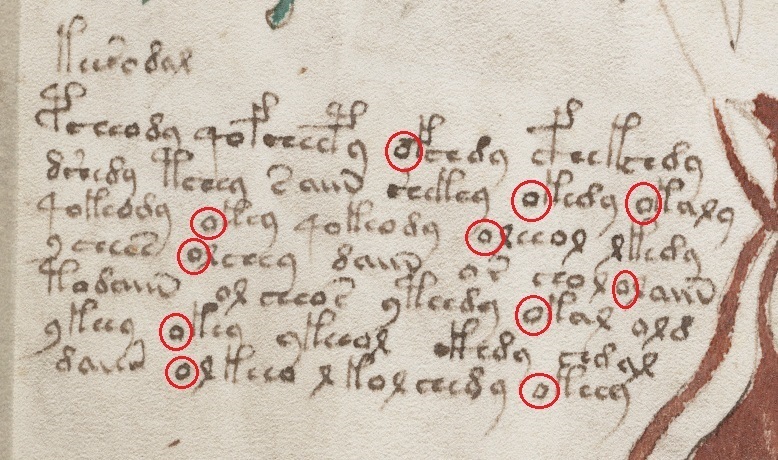 I agree that the German sample features interesting similarities with the Voynich script. I am not sure of why you have highlighted EVA:o and the abbreviation for Latin “et”. If you are suggesting that the EVA:o- prefix might correspond to a conjunction (like “et”=and), this seems contradicted by the fact that o- occurs about twice as frequently in Voynich labels than in Voynich paragraphs. I do not think the “o” in Eva “et” is. It is more like “a” or “i”. the same as in German “der, die, das, ein, eine”, or english “the” or “one”. Where “a” or “i” is used depending on the region. Just like the “g” is used as an ending, prefix, single, or as a letter. Le chapitre des plantes est consacré à l’étude des 22/27 LETTRES de cet ALPHABET. Leurs GRAPHISMES sont les représentations très fidèles des singularités numériques de chaque LETTRE ou associations de LETTRES entre Elles……Un genre de PIERRES de ROSETTE explicatives. Ces informations que voici ,vont également vers les diverses communautés Juives…avec une approche explicative qui leur est propre. IMPORTANT à COMPRENDRE CECI pour la suite des explications à venir. Transmettre la TORAH est un acte fondamental chez les Juifs. Au XIV et XV siècles les persécutions étaient légions contre la communauté Juive en Europe . Ce codex est d’une écriture surprenante….. très répétitive… très numérique..avec en prime des symboles graphiques inconnus. UN Rabbin digne de ce NOM ,ne peut voiler les 22 LETTRES de la TORAH. Symbolique pour les kabbalistes Hébreux …ce n’est pas un voile, on se trouve devant une écriture hébraïque d’un autre niveau…de forme ALPHA NUMÉRIQUE …tout simplement. Le signe de forme 8…est la représentation matériel de chaque lettre des 22/27 lettres de cet Alphabet……. c’est une idée numérique dans l’esprit ,mais on ne doit pas la comptabiliser dans la recherche de lecture du texte. Ce signe de forme 8…à deux niveaux de lecture .. ALPHABET HÉBRAÏQUE ….. SINGULARITÉS NUMÉRIQUES des 22 Lettres de cet Alphabet, pour construire le Texte du Codex Voynich. Ce n’est pas un Codage! Mr Stephen Bac… de L’HÉBREU ..un Livre HÉBRAÏQUE! À vous d’apporter des éléments contradictoires sur le contenu du codex et de sa formulation Numérique Hébraïque. Soit Les 20 Rayons de lumière de cette Figure. Le signe de Forme…9…doit se Lire: fait de 3…..ou 3 fois …ou en 3 place . Voici pour les universitaires……IL FAUT FAIRE SIMPLE!!! It is not clear to us what exactly you mean. Can you please translate a section of the manuscript, if possible? Or at least explain clearly how you think the manuscript is encoded? I just caught up with Derek Vogt’s videos, and would like to comment on the most recent one (Feb 21, 2017). 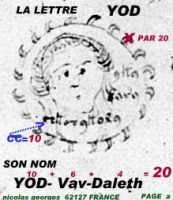 There he pointed out that in his interpretation an apparent “alveolar-palatal collapse” had occurred in the phonetics of the version of Romani used in the Voynich, relative to the Romani that carried on in subsequent locations and centuries. As the Voynich itself is clearly a work regarding specialized knowledge, I think it would not be surprising to find that the pronunciation of words used in such a context could be traditional among the practitioners, intentionally voiced in a subtly different way from common public usage and encoded in a variant alphabet. I think that the language *may* be Romani; the script, a similar ‘folk Brahmic’ script to the many completely informal merchants’ and moneylenders’ scripts historically found widely in northern and central India – a unique case of a ‘Romani script’, otherwise now lost from Romani (and Sinti etc. ; ‘Gypsy’) tradition, but still preserved in the 16th century. and possibly transcribed by a scribe used to a good Italian hand. I just stumbled on the video about the ten deciphered words and that was exactly what I was thinking! Possibly a Romani clan knowing they were ‘petering out’ for want of a more polite term and fearing all their knowledge being lost documented it. So rare to write it out instead of tell it orally but I suppose if you are the chovanni and have no one left to teach you have to do something to pass it on.